We all hate waiting behind a school bus on the way to work. Ali Haghani, professor in the department of civil and environmental engineering at the University of Maryland, determines if school bus routes could be made more efficient. 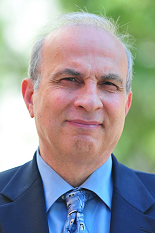 Dr. Haghani is Professor and Chairman of the Department of Civil and Environmental Engineering at the University of Maryland at College Park. He holds a BS degree in civil engineering from Shiraz University in Iran and an MS and a PhD degree in civil engineering from Northwestern University. Prior to coming to the University of Maryland, he taught as an Assistant Professor at the University of Pittsburgh and was a Post Doctoral Fellow and Research Scientist at Northwestern University. Dr. Haghani is an expert in transportation systems analysis, large scale mathematical modeling, traffic management, logistics, and emergency response. Dr. Haghani has over twenty years of experience in research and education as well as vast experience in managing research programs and administrative expertise. He has completed many research projects for several sponsors including Maryland State Highway Administration, Maryland Mass Transit Administration, Federal Highway Administration, and I-95 Corridor Coalition. Some of his most recent completed projects are the evaluation of the cellular probe data for the Baltimore Multimodal Traveler Information System (MMTIS) in which he applied statistical analysis techniques to evaluate the quality of traffic data provided by the cellular probes compared with the traffic data collected using the traditional vehicle probes; and development of a methodology for quantifying the cost effectiveness of freeway service patrols. He is currently conducting the evaluation of the real-time travel data provided by Inrix to I-95 Corridor Coalition member states as part of the I-95 Corridor Coalition Vehicle Probe Project. He has served as the chairman of the TRB Committee on Transportation Network Modeling. He is a member of ASCE, the Institute of Transportation Engineers, ITS America, and the Institute for Operations Research and the Management Sciences. Dr. Haghani has also served as a member of the Editorial Advisory Board of Transportation Research and is currently Associate Editor of the Journal of Intelligent Transportation Systems. Transporting elementary, middle, and high school students on a daily basis presents a large and complex problem. Some school districts use existing software systems to develop their bus routes. Others still develop these routes manually. Over the past year, we have been working with the Howard County Public School System in Maryland to analyze its transportation system and recommend ways to improve it. We have developed three models to optimize school bus routes. The first model links the bus trips for different schools to create a route for a bus in an optimal manner minimizing the total number of buses and the amount of time the buses run without any students onboard. A bus trip in the afternoon starts from a given school and visits a sequence of stops, dropping off students until the bus is empty. Our analysis showed that the Howard County Public School System can save between five and seven percent on the number of buses needed. The second model tackles the problem of the bus trips themselves. This model determines what trips are required to serve the students for each school in the system, given bus capacities, stop locations and the number of students at each stop by not only minimizing the number of trips, but also how these trips can be linked together. The third model optimizes the school bell times, given that each of the elementary, middle and high school start times fall within a pre-specified time window. Our model looks at all of the bus trips and searches for the optimal combination of school dismissal times such that the number of school buses is minimized. We found that, in most cases, optimizing the bell-times results in significant savings. These models can potentially be implemented in all school districts in the nation. Many of these districts would benefit from using such models to evaluate their current operations and determine if any savings can be realized. With many municipalities struggling with budgets, this sort of innovation could save money without degrading service.